The Bailiwick of Guernsey ( ; ) is a British Crown Dependency in the English Channel off the coast of Normandy. As well as the island of Guernsey itself, it also includes Alderney , Herm , Jethou , Brecqhou , Burhou , Lihou, Sark and other islets. Although the defence of all these islands is the responsibility of the United Kingdom , the Bailiwick of Guernsey is not part of the U.K. but rather a separate possession of the Crown, comparable to the Isle of Man . Guernsey is also not part of the European Union. The island of Guernsey is divided into 10 parishes. Together with the Bailiwick of Jersey , the Bailiwick of Guernsey is included in the collective grouping known as the Channel Islands. Guernsey belongs to the Common Travel Area. Rising sea levels transformed Guernsey first into the tip of a peninsula jutting out into the emergent English Channel , then, around 6000 BC, into an island when it and other promontories were cut off from continental Europe. At this time, Neolithic farmers settled the coasts and created the dolmens and menhirs that dot the islands. The island of Guernsey contains three sculpted menhirs of great archaeological interest; the dolmen known as L'Autel du Dehus also contains a dolmen deity known as Le Gardien du Tombeau. During their migration to Brittany, the Britons occupied the Lenur Islands (former name of the Channel Islands including Sarnia or Lisia (Guernsey) and Angia (Jersey). It was formerly thought that the island's original name was Sarnia, but recent research indicates that may have been the Latin name for Sark ; although Sarnia remains the island's traditional designation. Coming from the Kingdom of Gwent , Saint Sampson (abbot of Dol, in Brittany) is credited with the introduction of Christianity to Guernsey. In 933 the islands, formerly under the control of the kingdom, then Duchy of Brittany were annexed by the Duchy of Normandy. The island of Guernsey and the other Channel Islands represent the last remnants of the medieval Duchy of Normandy. In the islands, Elizabeth II's traditional title as head of state is Duke of Normandy. During the English Civil War, Guernsey sided with Parliament, while Jersey remained Royalist. Guernsey's decision was mainly related to the higher proportion of Calvinists and other Reformed churches, as well as Charles I's refusal to take up the case of some Guernsey seamen who had been captured by the Barbary corsairs. The allegiance was not total, however, there were a few Royalist uprisings in the southwest of the island, while Castle Cornet was occupied by the Governor, Sir Peter Osbourne, and Royalist troops. Castle Cornet, which had been built to protect Guernsey, was turned on by the town of St. Peter Port, who constantly bombarded it. It was the last Royalist stronghold to capitulate, in 1651. During the wars with France and Spain during the 17th and 18th centuries, Guernsey shipowners and sea captains exploited their proximity to mainland Europe, applying for Letters of Marque and turning their merchantmen into privateers. The 19th century saw a dramatic increase in prosperity of the island, due to its success in the global maritime trade, and the rise of the stone industry. One notable Guernseyman, William Le Lacheur, established the Costa Rican coffee trade with Europe. The Bailiwick of Guernsey was occupied by German troops in World War II. Before the occupation, many Guernsey children were evacuated to England to live with relatives or strangers during the war. Some children were never re-united with their families. Guernsey island, seen from 33,000 feet above. During the occupation, some people from Guernsey were deported by the Germans to camps in the southwest of Germany , notably to Biberach an der Riß and interned in the Lindele Camp ("Lager Lindele"). There was also a concentration camp built in Alderney where forced labourers, predominantly from Eastern Europe, were kept. It was the only concentration camp built on British soil and is commemorated on memorials under the Alderney's name in French: 'Aurigny'. Some 2,200 U.K. born islanders were also deported to prison camps in Germany, notably Biberach an der Riß . Also deported was Ambrose (later Sir Ambrose) Sherwill, who, as the President of the States Controlling Committee, was de facto head of the civilian population. Sir Ambrose, who was Guernsey-born, had served in the British Army during the First World War and later became Bailiff of Guernsey. Certain laws were passed at the insistence of the occupying forces ; for example, a reward was offered to informants who reported anyone for painting "V-for Victory" signs on walls and buildings, a practice that had become popular among islanders who wished to express their loyalty to Britain. Tragically, two islanders of Jewish descent were deported to Auschwitz , never to return. Guernsey was very heavily fortified during World War II by 4x Russian 305mm guns made in 1911 out of all proportion to its strategic value. There are German defences visible all round the coast and additions were made to Castle Cornet and a windmill. Hitler became obsessed with the idea that the Allies would try to regain the islands at any price, and over 20% of the material that went into the Atlantic Wall was committed to the Channel Islands. 47 000 sq m of concrete were used on gun bases . Most of the German fortifications remain intact; although the majority of them are on private property, several are open to the public. The deliberative assembly of the The States of Guernsey ( ) called the States of Deliberation ( ), consists of 45 People's Deputies, elected from multi- or single-member districts every four years. There are also two representatives from Alderney , a semi-autonomous dependency of the Bailiwick, but Sark sends no representative. There are also two non-voting members: H.M. Procureur (Attorney General) and H.M. Comptroller (Solicitor General), both appointed by the Crown and collectively known as the Law Officers of the Crown. A Projet de Loi is the equivalent of a U.K. Bill or a French projet de loi, and a Law is the equivalent of a U.K. Act of Parliament or a French loi. A draft Law passed by the States can have no legal effect until formally approved by Her Majesty in Council and promulgated by means of an Order-in-Council. Laws are given the Royal Sanction at regular meetings of the Privy Council in London, after which they are returned to the Islands for formal registration at the Royal Court. The States also make delegated legislation known as 'Ordinances (Ordonnances)' and 'Orders (Ordres)' which do not require Royal Assent. Commencement orders are usually in the form of Ordinances. The Lieutenant Governor is the representative of the Crown. The official residence of the Lieutenant Governor is Government House. Since 18 October 2005 the incumbent has been Vice-Admiral Sir Fabian Malbon, born in Southsea , Portsmouth , in 1946 and a serving naval officer 1965-2002. His last naval posting before retirement from the Royal Navy was deputy commander-in-chief of fleet. Each parish is administered by a Douzaine. Douzeniers are elected for a six year mandate, two Douzeniers being elected by parishioners at a parish meeting in November each year. The senior Douzenier is known as the Doyen (Dean). Two elected Constables ( ) carry out the decisions of the Douzaine, serving for between one and three years. The longest serving Constable is known as the Senior Constable and his or her colleague as the Junior Constable. The legal system is Guernsey customary derived from Norman French customary law, heavily influenced and overlaid by English common law, justice being administered through a combination of the Magistrates' Court and the Royal Court. Members of Guerney's legal profession are known as Advocates ( ), there being no distinction between solicitors and barristers as in England and Wales: Guernsey Advocates fulfill both roles. The Royal Court of Guernsey (French la Cour Royale de Guernesey) is made up of the Bailiff (French le Bailli), who presides and determines issues of law, and between twelve and sixteen Jurats (French Jures-Justiciers de la Cour Royale), who determine issues of fact and are elected to office by an electoral college known as the States of Election (French les Etats d'Election). Appeals lie from the Royal Court to the Guernsey Court of Appeal and thereafter to the Judicial Committee of the Privy Council . ),. Several European countries have consulate presence in the island. The French Consulate is based at Victor Hugo's former residence at Hauteville House. The German Honorary Consulate is based at local design and advertising agency Betley Whitehorne. At , Alderney, Guernsey, Herm, Sark, and some other smaller islands have a total area of 30 square miles (78 km²) and a coastline of about 30 miles (50 km). By itself, the island of Guernsey has a total area of 25 square miles (63 km²). Guernsey is situated 30 statute miles (48 km) west of France's Normandy coast and 75 statute miles (121 km) south of Weymouth, England and lies in the Gulf of St Malo . Lihou, a tidal island, is attached to Guernsey by a causeway at low tide. The terrain is mostly level with low hills in southwest. Elevation varies across the bailiwick from sea level to 375 feet (114 m) at Le Moulin on Sark. The highest point in mainland Guernsey is Hautnez (363 ft; 110 m), in Alderney at Le Rond But (306 ft; 93 m), in Jethou (248 ft; 75.6 m) and Herm (322 ft; 98 m). Natural resources include cropland. Guernsey itself contains two main geographical regions, the Haut Pas, a high southern plateau, and the Bas Pas, a low-lying and sandy northern region. In general terms, the Haut Pas is the more rural of the two, and the Bas Pas is more residential and industrialised. There is a large, deepwater harbour at St Peter Port . The Casquets, a group of islets, are notable for the lighthouse facility constructed there. The climate is temperate with mild winters and cool sunnier summers. The hottest months are August and September where temperatures are generally around 20 °C (68 °F). On average, the coldest month is February with an average weekly mean air temperature of 6°C. Average weekly mean air temperature reaches 16°C in August. Snow rarely falls and is unlikely to settle, but is most likely to fall in February. The temperature rarely drops below freezing, although strong wind-chill from Arctic winds can sometimes make it feel like it. The rainiest months are December (average 108 mm), November (average 98 mm) and January (average 89 mm). July is on average the sunniest month with 250 hours recorded sunshine; December the least with 50 hours recorded sunshine. 50% of the days are overcast. 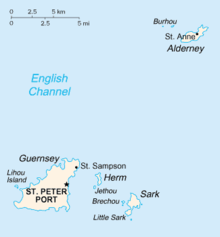 The island of Guernsey is divided into ten parishes and each of the smaller islands of Alderney and Sark also constitutes a parish (Saint Anne and Saint Peter, respectively). Unlike many countries, Guernsey has not delegated money-creation to the central bank and has instead issued interest-free money from 1822 to 1836, stimulating the growth of economy after Napoleon's wars without creating public debt and without increasing taxes. There is evidence that introducing fiat money (either via a central bank or without one) "stimulates the growth of the economy" in the long term. Also gold and silver coin remained money in Guernsey in the period 1822 to 1836 - and indeed long after. Financial services, such as banking, fund management, and insurance, account for about 32% of total income. Tourism, manufacturing, and horticulture, mainly tomatoes and cut flowers, especially freesias, have been declining. Light tax and death duties make Guernsey a popular offshore finance centre for Private equity funds. However, while Guernsey is not a member of the European Union, the EU is forcing Guernsey to comply more and more with its rules . As with other offshore centres, Guernsey is also coming under increasing pressure from bigger nations to change its way of doing business in many ways. Guernsey is currently changing the way its tax system works in order to remain OECD and EU compliant. From 1 January 2008 it will operate a Zero-Ten corporate tax system where most companies will pay 0% corporate tax and a limited number of specific banking activities will be taxed at 10%. As a result it is confronting what it terms a financial "black hole" of forty-five million pounds or more according to some estimates which it aims to fill through economic growth and indirect taxation. Guernsey now has the official ISO 3166-1 alpha-2 code GG and the official ISO 3166-1 alpha-3 code GGY; market data vendors, such as Reuters, will report products related to Guernsey using the alpha-3 code. Guernsey issues its own sterling coinage and banknotes. UK coinage and (English, Scottish and Northern Irish faced) banknotes also circulate freely and interchangeably.Public services, such as electricity, water, and postal services have been commercialised by the States and are now operated by companies wholly owned by the States of Guernsey. Guernsey Telecoms which provided telecommunications was sold by the States to Cable & Wireless. Newtel was the first alternative telecommunications company on the island and now provides a wide range of residential and business telecommunication services as well as high specification data centres. Wave Telecom, (owned by Jersey Telecom) also provides some telecommunications excluding local loop services. Gas is supplied by an independent private company. Both the Guernsey Post postal boxes (since 1969) and the telephone boxes (since 2002) are painted blue, but otherwise are identical to their British counterparts, the red pillar box and red telephone box. Ports and harbours exist at St Peter Port and St Sampson's. There are two paved airports in the Bailiwick (Guernsey Airport and Alderney Airport ), and 3 miles (5 km) of railways in Alderney .The States of Guernsey wholly own their own airline Aurigny Air Services. The decision to purchase the airline was made to protect important airlinks to and from the island and the sale was completed on 15 May 2003. The Guernsey Railway , which was virtually an electric tramway, and which began working on 20 February 1892, was abandoned on 9 June 1934. It replaced an earlier transport system which was worked by steam, and was named the Guernsey Steam Tramway. The latter began service on 6 June 1879 with six locomotives. This leaves Alderney as the only Channel Island with a working railway . The population is 65,726, as of 2008. The median age for males is 41 years and for females is 43 years. The population growth rate is 0.228% with 8.57 births/1,000 population, 10.09 deaths/1,000 population, and 3.8 migrant(s)/1,000 population. The life expectancy is 77.64 years for males and 83.76 years for females. 1.4 children are born per woman. Ethnic groups consist of British and Norman-French descent, Portuguese, Latvian and South African.For immigration and nationality purposes it is UK law, and not Guernsey law which applies (technically the Immigration Act 1971, extended to Guernsey by Order-in-Council). Guernsey may not apply different immigration controls to the UK and EEA nationals free movement rights to enter the territory of the British Islands and remain apply also in Guernsey, although there are de facto restrictions on occupation of housing by everyone. The housing market is split between local market properties and a small number of open market properties. Anyone may live in an open market property, but local market properties can only be lived in by those who qualify - either through being born in Guernsey (to local parents), by obtaining a housing licence, or by virtue of sharing a property with someone who does qualify. Housing licences are for fixed periods, and are usually only valid for as long as the individual remains employed by a specified Guernsey employer. These restrictions apply equally regardless of whether the property is owned or rented, and only applies to occupation of the property. Thus a person whose housing licence expires may continue to own a Guernsey property, but will no longer be able to live in it. There are a number of routes to qualifying as a "local" for housing purposes. Generally it is sufficient to be born to at least one Guernsey parent, and to live in the island for ten years in a twenty year period. Once "local" status has been achieved it remains in place for life. Even a lengthy period of residence outside Guernsey does not invalidate "local" housing status. More details may be obtained from the States Housing Control Department. Although Guernsey's inhabitants are full British citizens, an endorsement restricting the right of establishment in other European Union states is placed in the passport of British citizens connected solely with the Channel Islands and Isle of Man . Those who have a parent or grandparent born in the United Kingdom itself (England, Scotland, Wales and Northern Ireland), or who have lived in the United Kingdom for 5 years, are not subject to this restriction. Guernsey adopts mainly England's National Curriculum, including the use of the GCSE and A Level system, in terms of content and structure of teaching. Children are allocated a primary school on a basis of catchment area, or are allowed to attend either of two Catholic primary schools. In terms of admissions however the island continues to use the 11 plus exam to decide on whether a child should receive education at the Grammar School , or receive state funded places at the independent schools Elizabeth College for boys, and The Ladies College for girls or Blanchelande Girls College for Roman Catholics. Parents have the choice to send children to independent schools as fee payers. For children who are not selected for the Grammar School or colleges, they attend the secondary schools of La Mare de Carteret School , Les Beaucamps School, or St Sampson's High. The Education Department is currently part way through an ambitious programme of re-building its secondary schools. So far the Department has completed the building of La Rondin special needs school, the Sixth Form Centre at the Grammar School and the first phase of the new College of FE - a purpose-built performing arts centre. The contstruction of St. Sampsons High was completed summer 2008 and admitted its first students in September 2008. In the past, students could leave school at the end of the term in which they turned 14, if they so wished: a letter was required to be sent to the Education department to confirm this. However, this option was undertaken by relatively few students, the majority choosing to complete their GCSEs and then either begin employment or continue their education. From 2008 onwards, the school leaving age was raised to the last Friday in June in the year a pupil turns 16, in line with England, Wales and Northern Ireland. This means students will be between 15 and 10 months and 16 and 10 months before being able to leave. In 2001 along with planned redevelopment of secondary schools the then Education Council tried unsuccessfully to abolish this system. Nevertheless there is now a planned redevelopment of state schools across the island, however most of the plan is subjected to securing state funding. Post GCSE students have a choice of transferring to the state run The Grammar School and Sixth Form Centre, or to the independent colleges for academic AS/A Levels. They also have the option to study vocational subjects at the island's Guernsey College of Further Education. There are no established universities on the island. Students who attend university in the United Kingdom receive state support towards both maintenance and tuition fees. Recently however, the States of Guernsey Education Department has proposed the introduction of student loans for middle and upper income earners due to the black hole deficit in state spending in 2008. This has been met with much opposition by local politicians, families and students who argue that it will deter future students from going and returning from university, due to very high housing and living costs in Guernsey. The department argues that it had no choice but to introduce them. The decision was first deferred to 2009, however upon the election of new deputies in the 2008 April elections, the decision is now deferred until 2011. English is the language in general use by the majority of the population, while Guernesiais, the Norman language of the island, is currently spoken fluently by only about 2% of the population (according to 2001 census). However, 14% of the population claim some understanding of the language. Sercquais is spoken by a few people on the island of Sark and Auregnais was spoken on the island of Alderney until it became extinct in the early twentieth century. Until the early twentieth century French was the only official language of the Bailiwick, and all deeds for the sale and purchase of real estate in Guernsey were written in French until 1971 . Family and place names reflect this linguistic heritage. Georges Métivier, considered by some to be the island's national poet, wrote in Guernesiais. The loss of the island's language and the anglicisation of its culture, which began in the nineteenth century and proceeded inexorably for a century, accelerated sharply when the majority of the island's school children were evacuated to the U.K. for five years during the German occupation of 1940-1945. Victor Hugo wrote some of his best-known works while in exile in Guernsey, including Les Misérables. His home in St. Peter Port , Hauteville House, is now a museum administered by the city of Paris . In 1866, he published a novel set in the island, Travailleurs de la Mer (Toilers of the Sea), which he dedicated to the island of Guernsey. The best-known novel by a Guernseyman is The Book of Ebenezer Le Page, by GB Edwards which, in addition to being a critically-acclaimed work of literature, also contains a wealth of insights into life in Guernsey during the twentieth century. Henry Watson Fowler moved to Guernsey in 1903 where he and his brother Francis George Fowler composed The King's English and the Concise Oxford Dictionary, and much of Modern English Usage. The national animals of the island of Guernsey are the donkey and the Guernsey cow. The traditional explanation for the donkey (âne in French and Guernésiais) is the steepness of St Peter Port streets that necessitated beasts of burden for transport (in contrast to the flat terrain of the rival capital of St. Helier in Jersey ), although it is also used in reference to Guernsey inhabitants' stubbornness. The Guernsey cow is a more internationally famous icon of the island. As well as being prized for its rich creamy milk, which is claimed by some to hold health benefits over milk from other breeds , Guernsey cattle are increasingly being raised for their beef, which has a distinctive flavour and rich yellow fat. Although the number of individual islanders raising these cattle for private supply has diminished significantly since the 1960s, Guernsey steers can still be occasionally seen grazing on L'Ancresse common. There is also a breed of goat known as the Golden Guernsey, which is distinguished by its golden-coloured coat. At the end of World War II, the Golden Guernsey was almost extinct, due to interbreeding with other varieties on the island. The resurrection of this breed is largely credited to the work of a single woman, Miss Miriam Milbourne. Although no longer considered in a 'critical' status, the breed remains on the "Watch List" of the Rare Breeds Survival Trust. A local delicacy is the ormer (Haliotis tuberculata), a variety of abalone harvested from the beach at low spring tides, although strict laws control their harvesting. Of the many traditional Guernsey recipes, the most renowned is a stew called Guernsey Bean Jar. It is a centuries-old stew that is still popular with Islanders, particularly at the annual 'Viaer Marchi' festival, where it served as one of the main events. In July 2006 smoking in enclosed public places was banned, a law put in place to protect workers' right to a healthy working environment. Guernsey participates in the bi-annual Island Games, which it hosted in 1987 and 2003. Guernsey participates in its own right in the Commonwealth Games. In sporting events in which Guernsey does not have international representation, when the British Home Nations are competing separately, islanders that do have high athletic skill may choose to compete for any of the Home Nations – there are, however, restrictions on subsequent transfers to represent another Home Nation. The football player Matt Le Tissier for example, could have played for the Scotland national football team but ended up playing for England. The Guernsey Football Association runs Guernsey football. The top tier of Guernsey football is the Sure Mobile Priaulx league where there are 7 teams (Belgrave Wanderers, Northerners, Sylvans, St Martin's, Rovers, Rangers and Vale Recreation). The champions in 2006-07 were Northerners. The second tier is the Jackson league which is a mixture of top league players, lower players and youth players. The third tier is the Railway League, featuring three extra teams, Alderney, Guernsey Police and Port City. The Corbet Football Field donated by Jurat Wilfred Corbet OBE in 1932 has fostered the sport greatly over the years. 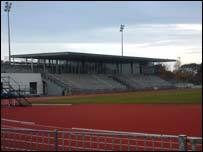 Although more recently the island has upgraded to a larger, better quality stadium, in Foote's Lane. Approximately 200 people play table tennis on a regular basis across four senior and two junior leagues. The GTTA centre, located next to the Hougue du Pommier, is equipped with 12 match tables, 6 training tables, a bar and a small café area. Guernsey regularly sends teams to represent the island in UK and world tournaments. Guernsey was declared an affiliate member by the International Cricket Council (ICC) in 2005 and an associate member in 2008. Guernsey also enjoys various motor sports. In season, regular races take place on the sands on Vazon beach on the west coast. Le Val des Terres, a steeply winding road rising south from St Peter Port to Fort George, is often the focus of both local and international hill-climb races. In addition, the 2005, 2006, and 2007 World Touring Car Champion Andy Priaulx is a Guernseyman. The racecourse on L'Ancresse Common was re-established in 2004, and races are held on most May day Bank Holidays, with competitors from Guernsey as well as Jersey, France and the UK participating. "Golden Guernsey" Rare Breeds Survival Trust. Retrieved 10 October 2007.